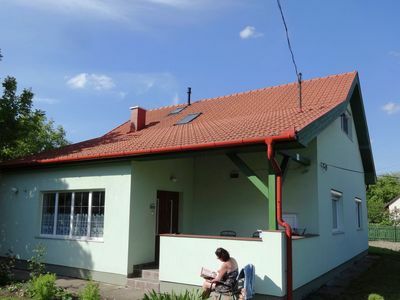 Detached holiday home directly at the Hortobáyer Puszta National Park. 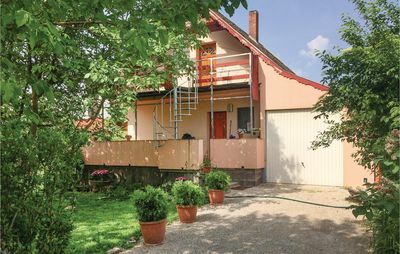 The house is located 200m from the centre of Hortobáyer Puszta National Park in a village with other single-family homes. Hortobáy Puszta National Park is developed for tourism. In addition to tourist information available in German as well as English, there are carriage rides in the Puszta, horse shows, riding opportunities, various museums, a zoo and a wildlife park. The surrounding areas offer thermal baths with a full rang of spa treatments and water temperatures of up to 40 degrees. The nearest major city is Debrécen (approx. 300 000 inhabitants) which is 40 km away. After a 26km drive you'll reach the most popular spa resort Hajduzoboslo with 10 000 m² of water surface. In both towns there are numerous recommended and reasonably-priced restaurants and a wide range of shopping opportunities. 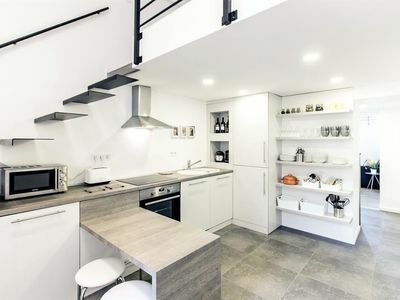 There are many brochures, leaflets and maps waiting for you in the house, from which you can choose interesting things to do and events to attend. Hortobágy's train station is also about 200m from the house, as well as a large well-known stud farm, grey cattle, water buffalo, &quot;Racka&quot; sheep, Mangalitsa pigs, a bird station for injured wild birds where they are treated and then released into the wild, and more. The church and the market in Hortobágy are also worth seeing.